In 1819 an act of Congress approved funding to place buoys in the Patapsco River and build lights at Bodkin Point, North Point, and Sparrows Point to aid shipping traffic to Baltimore. A survey of possible sites was made and a certain amount of trouble encountered gaining title to the land. Six acres of the twenty acres of Bodkin Island, were eventually purchased for $600. Bids were solicited and in 1821, the contract was awarded to Thomas Evans and William Coppeck under the charge of U. S. Naval Officer William Barney. Problems with both the contractors’ ability and character were encountered during the construction. The original contractors, Thomas Evans and William Coppuck, built the foundation, but were unable to complete the task. Naval Officer William Barney of the Port of Baltimore "had to compel them to pull down fifteen feet of the work having so far been erected, not in accordance with the terms of the contract." 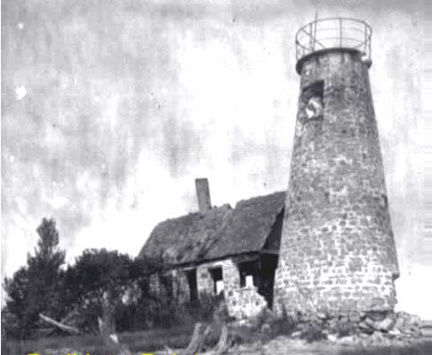 John Donahoo, who went on to build numerous lights on the bay, completed the 35-foot stone tower. Thirteen lamps were purchased from Winslow Lewis, and the station was formally inaugurated in January 1822, making it ‘possibly’ the first lighthouse in Maryland. Thirteen lamps were procured from Winslow Lewis and installed shortly thereafter. The light commissioned in January 1822. The lighthouse was plagued by problems stemming from its poor construction during much of its brief existence. In 1851 the station was one of many lights castigated in a Congressional audit of aids to navigation. The auditors found the light maintained by a blacksmith and his family who kept it in filthy, sooty condition. In 1856 the completion of Seven Foot Knolls Light obviated the need for the Bodkin Island Light and the station was decommissioned. The lantern room was removed, though lighthouse remained abandoned for many years. The keepers dwelling was inhabited by a fisherman for some time and later abandoned. In 1914 the tower collapsed. Since that then the 20+ acre island has been reclaimed by the bay. What remains of the site is marked as a "navigational hazard" on sea charts. One tale regarding the lighthouse says that a fisherman living in the abandoned keeper's house wished to be married, but no boat was available to bring the clergyman across to the island. Instead, the clergyman conducted the ceremony by shouting across the bay!